When I first started knitting I fell in love with the patterns by Tiny Owls Magic Attic. I even posted about the lovely patterns right here. 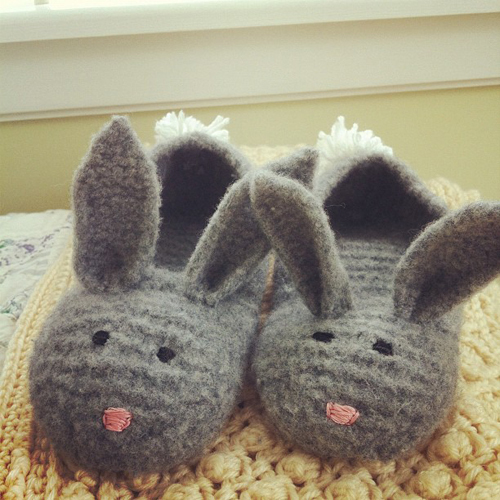 Well I happy to say I finally had enough guts and experience to try out their Hopsalots bunny slipper pattern. I made these slippers as a Christmas gift for my soon to be sister in law and she absolutely loved them. They were really easy and fast to knit, but if you decide to try this pattern out for yourself a few words of advice. First make a gauge swatch, it really does matter. And secondly, the pattern suggests felting these by hand in the sink, It would have taken me days to felt these by hand because I had to go up about 3 sizes in needles, so I felted them in the washing machine and they came out great! Have fun! No Responses to "Here comes peter cottontail"